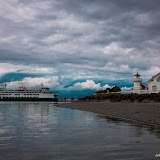 A few weeks back I posted a gallery from my visit to Mukilteo, WA. Here are a few of my favorite wildlife shots from the album. Same big photo album, just highlighting different pics. This cormorant dove hundreds of times and came up with fish nearly every time. I'd call this a double crested cormorant based on the other pics I can find online. Why settle for one fish, when you can have a whole beak full? The seagulls and I could tell when the cormorant was going to surface. The surface of the water began roiling with fish trying to swim away from the diving bird. Good news for a hungry seagull! This was a very mild mannered bulldog. He didn't even eat the little Yorkshire terrier that came yipping at his heels. Categories: "Cormorant", "Ferry", "Great Blue Heron", "Kitsap", "Mukilteo", "Puget Sound", "Seagull", "Seal", "Washington", "diving bird", "wildlife"